The angular contact light 7200 Series and 7300 medium Series is dimensionally interchangeable with the radial 6200 and 6300 series. A single bearing is recommended for applications in which the trust load is in one direction or, in case of combined loads, the thrust load is high in relation to the radial load. A duplex pair is recommended for applications where trust is present in both directions or where axial displacement of the shaft must be restricted. For exceptionally high thrust loads in one direction, tandem pair can be utilized opposed by a third bearing. Angular bearings are usually mounted in a group of two or more opposed preloaded units with rigid or elastic spacers. Typically, the inner and outer raceways and balls are made of chrome steel. 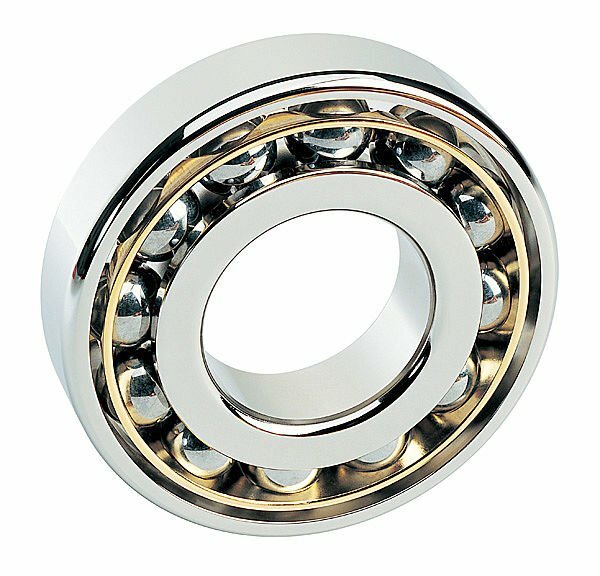 Where operating conditions are severe, bearings may have ceramic balls creating a hybrid bearing. Due to their internal design, angular contact ball bearings can withstand high radial-axial loads and reach high speeds. If you don't see your sizes please contact us.